Eggs - Dyes - Decorating Kits - It must be close to Easter! Throughout the country, parents and their children are buying eggs, boiling eggs, decorating eggs, hiding eggs, finding stinky eggs that were hidden last year and more. We dye hard boiled eggs every color of the rainbow, buy chocolate eggs wrapped in foil, stick to marshmallow eggs wrapped in plastic, eat jellybeans that look like eggs, play with plastic eggs with toys and candy inside and collect pysanki (eggs decorated in Ukranian Fashion), painted wooden eggs, porcelain eggs, jeweled eggs by Faberge and fill our homes with a large variety of other types and styles of eggs to eat, decorate, play with or to give away or to lose and find again at Easter next year. Mind you, this is not exclusive to America. This quest for pleasures and activities with eggs takes place throughout the world. The question is why? Not why about the chocolate, no one around my house EVER questions chocolate. But why eggs? And more, why eggs from bunnies? And, what do eggs have to do with Easter? Let's start first with Easter. Easter is the name of a religious celebration that is based on the Christian belief of the resurrection of Christ, and Christianity is considered a worldwide religion. But, nowhere in Biblical literature can this writer find anything about eggs and bunnies, including in the story of the crucifixion and resurrection. However, both eggs and bunnies are found in the celebrations of many ancient cultures that took place during the spring at about the same time that we celebrate Easter. So, to the age old question (slightly revised), "What came first, Easter or the egg?" The answer would have to be "the EGG." Folklore of Indo-European races talked about fertility celebrations taking place in the spring. Ancient people believed that a goddess was responsible for the return of spring each year. Seeing the earth bloom anew was considered a cause for celebration. Eggs were part of the celebration as they were considered to be a symbol of spring and of fertility. It was a startling event to see a new and live creature emerge from a seemingly dead object like an egg. This thought may have been the inspiration for Christians making the egg a special sign of Easter as the egg symbolized the rock tomb out of which Christ emerged. The giving of eggs began long before the time of Christ and Christianity. The egg has long been considered one of creations more perfect gifts. Throughout history, it has represented mystery, magic, medicine, food and spirituality. The ancient Persians gave each other eggs as means of celebrating the beginning of their new year, which took place at the time of the spring equinox. The Greeks gave eggs at their spring festivals. The Romans, who copied the Greeks in many things, gave red-painted eggs at the new year, and to this day an egg is one of the symbolic foods included on the Passover plate at Seder when the Jewish people throughout the world celebrate the new life of the people of Israel following their redemption from slavery in Egypt. The word Easter may have come from the Babylonian goddess of love, the Queen of Heaven, "Ishtar" (also known as "Astarte" and "Inanna" - but they can't seem to be pronounced like Easter). The egg was one of the symbols of fertility and love used by worshippers of the goddess. The English historian St. Bede (679-735 AD) suggested that the origin of the words Easter may have come from "Ostern" or "Eastre," the Scandinavian goddess of spring and renewal whose festival was celebrated on the day of the vernal equinox. Of course, that could be the dry English sense of humor at work, blaming the first "eggings" on the Swedes. Then, comes the clincher, the words of the infamous Brothers Grimm from Germany. They wrote stories about "Eostre" (another spelling - but same idea). They tell in their folk stories about a goddess Eostre who saved a bird during a harsh winter. In their tale, she turns the cold, spindly bird into a fuzzy warm hare (rabbit), in order to protect it from the cold. Of course in a Grimm tale, it had to be a magical rabbit that could lay eggs. 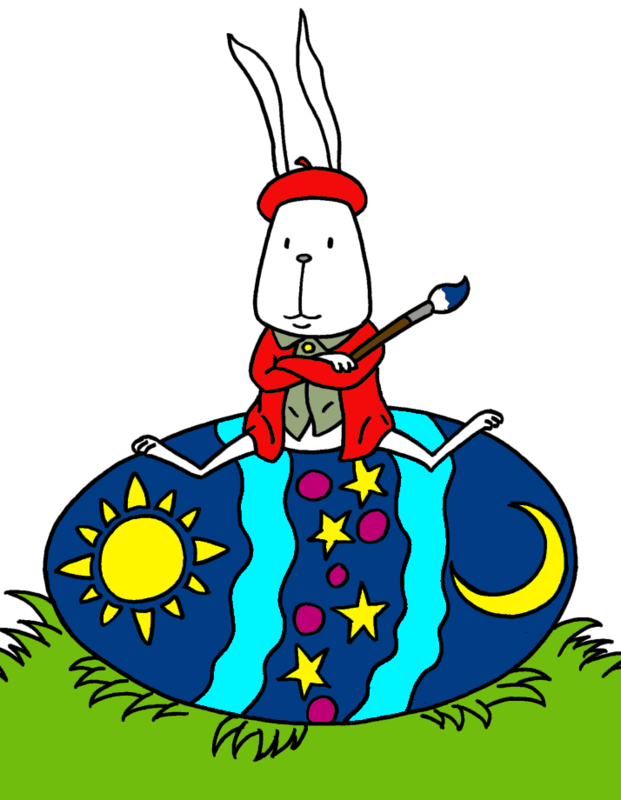 In legends and lore about Eostre, a hare nearly always accompanies her, so the mysterious connection between eggs and bunnies becomes clearer. Of course there is another explanation about a woman who dyed eggs for her children at Easter. She hid them in a nest, and when the children found the nest, a big rabbit hopped away. This left the children believing that a rabbit brought the eggs. No talking could persuade them otherwise since, "Seeing IS believing for children." Isn't it? The first documented use of the bunny as a symbol at Easter came from Germany in the 1500's. The Pensylvania Dutch brought the stories about a generous bunny "Oschter Haws" with his gifts to the American colonies during the 1700's. It was also the Germans who started making the first chocolate bunnies in the 1800's. Children of German ancestry were the first to enjoy the arrival of the Easter bunny bringing candy and gifts. From there, it took good advertising by European candy makers during the nineteenth century to build on the cultures of the past to pair the Easter Egg and the Easter Bunny and build the candy giving hype it to the frenzy that hits so many homes on Easter morning every year. This explains a bit about how the candy part of Easter began, but how did the idea of eggs get mixed with religion? Some writings suggest that the ancient Saxons may have been the first people to combine the pagan celebration of the return of spring "Eastre." Christian missionaries encountered the tribes from the north with their pagan celebrations and found them reluctant to give up their pagan beliefs. The missionaries were clever enough to let groups hold their pagan celebrations in a Christian manner. Converts were won over, and the name Eastre was eventually changed to the current spelling, Easter. The symbolism of the egg changed from the pagan concept of nature's rebirth to the Christian belief of salvation and the rebirth of man. Chocolate eggs are relatively new, but the idea of decorating eggs is not. Originally Easter eggs were dipped in natural plant dyes while still raw and were brightly colored to represent the sunlight of spring. After they were colored, they were etched with designs or colored with gold foil and decorated in many other fashions, often to be given as gifts. Throughout the world eggs are still dyed, painted and decorated sometimes for fun, and sometimes with symbols representing the Christian beliefs. Whatever colors or symbols, there only seems to be one missing element of the candy end of Easter morning, the basket. Christians in Europe had accepted the custom of giving eggs as Easter gifts during the 4th century A.D. However, the Catholic Church ordered fasting from the eating of meat and eggs during the 40 days that preceded Easter. But, hens kept laying, and the people kept decorating eggs during lent. The custom began to take one's eggs to Easter Mass to be blessed on Easter morning, and of course, the eggs were carried in a container of some type or an "Easter Basket." The eggs were feasted on and given as gifts. Being surplus items for a temporary time, children even played games with the eggs - thus starting the first egg hunts, egg rolls and a number of other games played at Easter time.